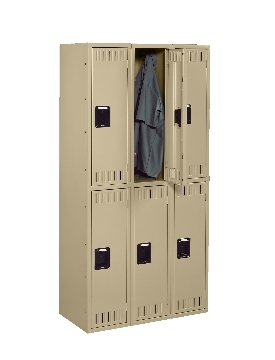 Lockers are available in single, double or triple tier configurations with many door options, solid, ventilated or C-Thru style doors as well as different lock options, standard hasps, combo locks or more advanced locking options. Other options include sloped tops, closed partitions for legs, shelves, partitions, ADA compliant locks, name & number plates and more. Locker depths of 15", 18", 21", or 24"
Built-in top shelf for lunches, hats, etc. 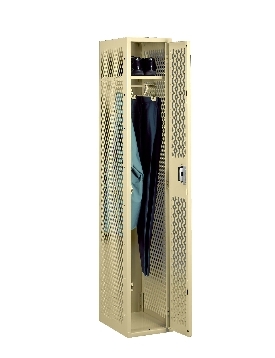 Double tier lockers feature two openings per locker, giving you twice as many lockers in the same space, yet providing plenty of hanging room for shirts and jackets. Perfect for the gym! Optional locks and other accessories available. 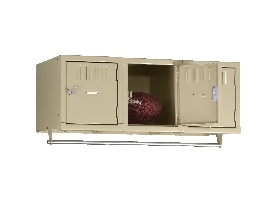 Tennsco box lockers are ideal for securely storing smaller items like purses, lunches, books, and athletic gear. The effi cient fi ve and six tier confi gurations give schools, clubs, and hospitals the necessary storage capabilities without taking up valuable floor space. 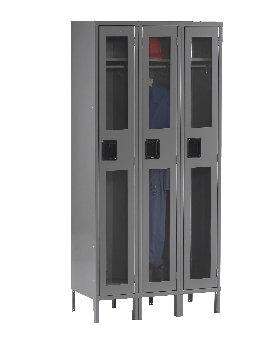 Looking for a compact locker solution that offers employees or students secure storage? 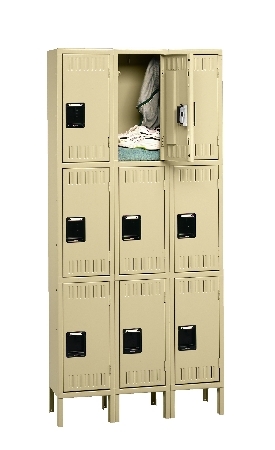 Tennscos unique fifteen person locker is the perfect choice. 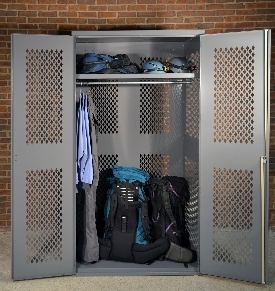 This storage solution offers both, hanging space for full length garments and fifteen secure box lockers providing organized storage all within 7½ square feet. Great for hallways or other small nooks within office or factory environments. Limited floor space? Consider our Three Person Wall Mounted Locker. Individual boxes are welded together for added strength. The included coat rod offers convenient hanging of long garments. Two people can enjoy full length storage in the space of a single locker. 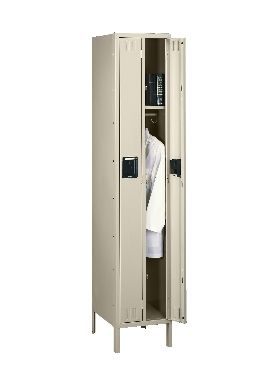 Our duplex unit is ideal for locations where garments are the primary item to be stored. 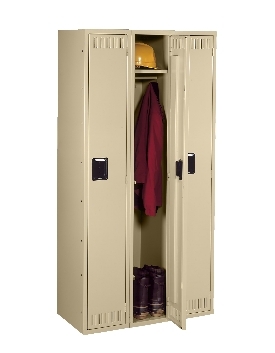 Locker depths of 15" and 18"
Tennsco Ventilated Lockers keep aisle ways and rooms free from stale odors caused by damp clothing. Specially designed diamond-shape ventilation slots ensure continuous airflow from all three sides of the locker. This reduces the opportunity for odor causing-bacteria to grow and thrive in clothing. Ventilated Lockers also offer interior visibility making it easy to identify undesirable contents. All Tennsco lockers feature a lightweight, low friction latching mechanism which opens easier and smoother than traditional latches. 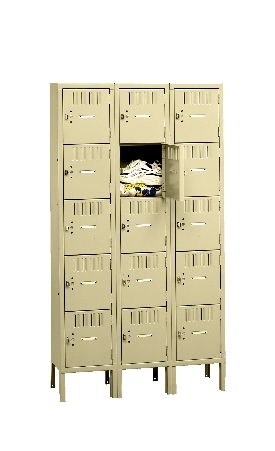 And Locker handles are recessed inside the door face, making Tennsco lockers vandal resistant and safer than easily broken, protruding handles.Tennsco lockers are available in an assortment of colors to blend in with conservative designs or stand out as part of a bold color scheme.